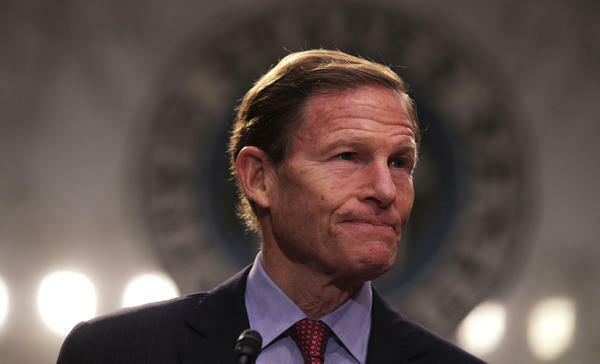 Sen. Richard Blumenthal, D-Conn., is among the more than 190 Democrats who are suing President Trump over his business deals involving foreign governments. More than 190 Democrats in Congress joined together to sue President Trump on Wednesday in the U.S. District Court for the District of Columbia. They say Trump is violating the U.S. Constitution by profiting from business deals involving foreign governments — and doing so without congressional consent. And they want the court to make it stop. Trump has "repeatedly and flagrantly violated" the Constitution's Emoluments Clause, Sen. Richard Blumenthal, D-Conn., told reporters on a conference call. The clause says that "without the Consent of the Congress," the president can't accept benefits "of any kind whatever from any King, Prince, or foreign State." Blumenthal said Trump "has never sought the consent of Congress" for the profits from deals in the more than 20 countries where he has business operations. Just one example he offered: Trump has sought — and obtained — valuable trademarks from China's government but did not clear those transactions with Congress. Blumenthal, who sits on the Senate Judiciary Committee, said it took "a lot of research" involving legal experts to determine who would have legal standing to successfully sue the president. "We have standing that no one else has" because the Constitution makes it clear that "the consent of Congress is absolutely essential," he said. The Democrats believe that Trump "must either sell his vast holdings ... or he must tell us and disclose now" all of the benefits he gets from foreign governments, he said. They also want to see the president's tax returns and business records. This suit is just the latest in a series of legal efforts to force Trump to fully separate himself from his business interests. Other suits have been filed by a public-interest group representing private businesses and the attorneys general of Maryland and the District of Columbia representing their jurisdictions. That means Trump is now facing a triple threat in court, with plaintiffs coming at him from 1) the private sector, 2) the state level and 3) Congress. Each group must try to convince a court that it has the legal standing to challenge a president. The private businesses say they are being harmed because Trump's D.C. hotel is presenting unfair competition, i.e., foreign officials take their business to Trump to win his favor. And Maryland's attorney general says that state's National Harbor resort — just across the river from Washington — also faces unfair competition. But the Democratic lawmakers are focused on what they call the harm being done by being stripped of the consent power granted by the Constitution. Trump has stepped back from daily management of the Trump Organization, but he has moved the assets into a trust, headed by his two oldest sons and a business associate. Trump is the sole beneficiary of the trust, and his son Eric Trump has said the president gets regular updates on profits. On Monday, White House press secretary Sean Spicer was asked about the lawsuit from the attorneys general, and he replied that Trump's business interests "do not violate the Emoluments Clause." Spicer noted that the lawsuits are being brought by Democrats. "It's not hard to conclude that partisan politics may be one of the motivations" for filing suit, Spicer said.